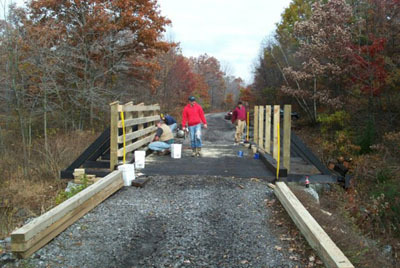 Steve Harkin working with volunteers on Rock Run Bridge. Steve Harkin has been a member of the SSRTA for the past 5 years. He has been an avid supporter of the trail, and loves to ATV. He often travels from his hometown of Lansdale near Philly to enjoy his recreation. Steve is an exceptional volunteer that traveled 4 hours to get here, slept in his van at times, carried all kinds of air tools and equipment to help renovate 5 bridges. He worked 12 hours on the trail and then traveled back to Philly in the same day--what dedication and loyalty! Without his help we couldn't have done as well as we did. Steve also maintains the PA ATVing website, and supports the SSRTA on that site too! Check it out! He is the main coordinator of the Majestic Mountains Trail Ride...in the Fall. The trail is located in Northwestern PA. A fun time for all--great trail and great BBQ pig roast . We REALLY want to thank you Steve for all your time and efforts.